Fantastic comments! when i played this game i always chose higher levels of play for more mountain top aliens to destroy, similar to what all have said, the fear factor in this game is just amazing, i used to travel round quite fast shooting the heck out of all things green, goose pimples from head top to toe nails and mass personal vocal prettyness from ones self, emrgency landings ,green dude anihalations, all just super exciting. used to annoy me when u landed to rescue a pilot, and a green freak on a mountain top keeps firing at you depleting your energy.....hurry up pilot! one of the best games ever. this is why my c64 collection went to the charity shop!! The best game ever. I can't forget the moment when the alien popped-up!. It was one of the scariest moment of my Childhood. Add me to the fill-your-trousers brigade when the alien popped up. Will never forget it. The greatest game of my youth! 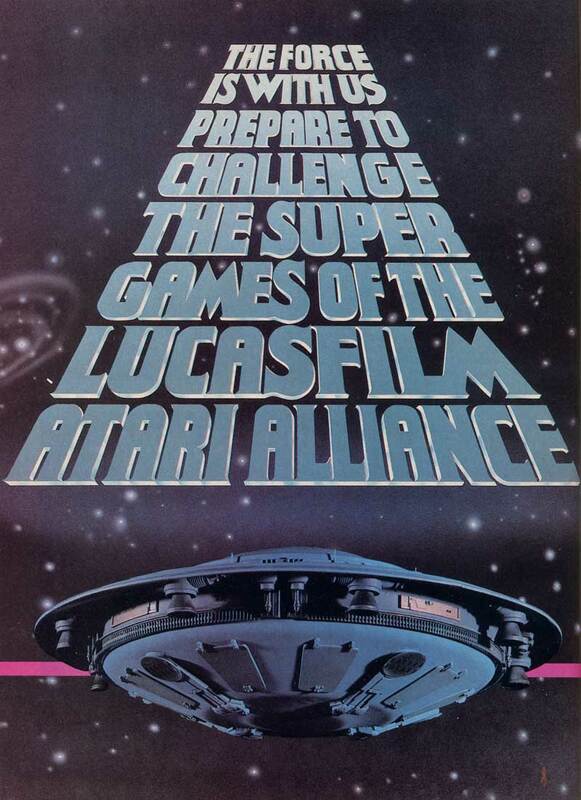 I've played every version of this game, and none can touch the Atari original. Everything about it is perfect - the smooth motion, the limited pop-up, the intro, the varied sound effects, the colors, the atmosphere and suspense - everything. 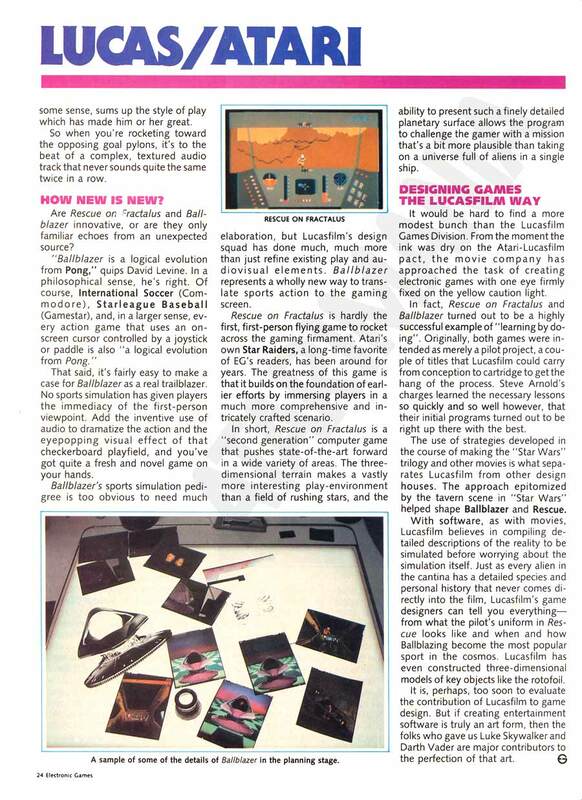 In my opinion, it's the best of the Lucasfilm fractal games. That said, it would be great to have a remake of it. what can be said.... amazing, a classic. 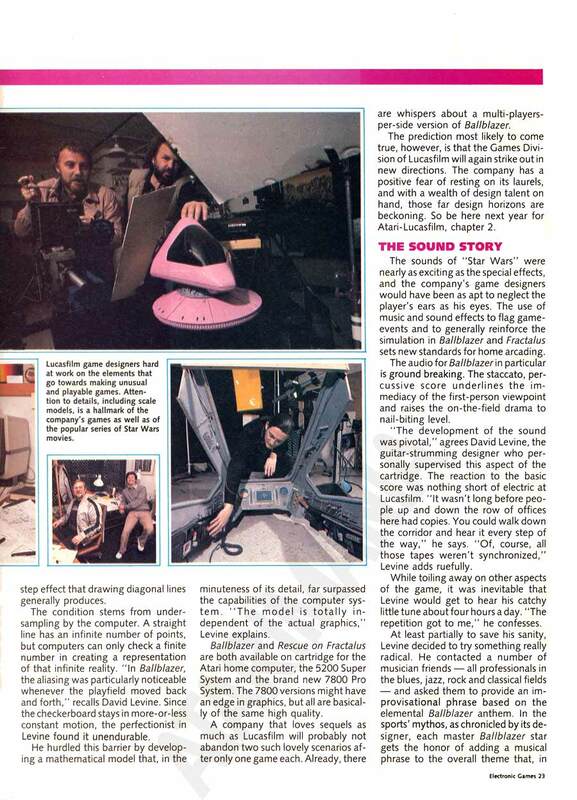 I used to play "Behind Jaggi Lines" an awful lot -- dark room, volume turned up, that long pause before the pilot (?) starts knocking on the door -- but this is the first time I've really played the REAL version. Differences: pilots are scarcer, some pilots are "Aces" (what's that all about? ), pilots left outside too long begin to knock slower, nice warning when you're in range of a pilot, the dot on the long range scanner is much bigger, and it seems to me that you don't actually SEE the pilots as much as you do in Jaggi Lines. The music is different (dramatic notes are held instead of repeated) and, of course, the intro. Awesome game, ahead of its time! 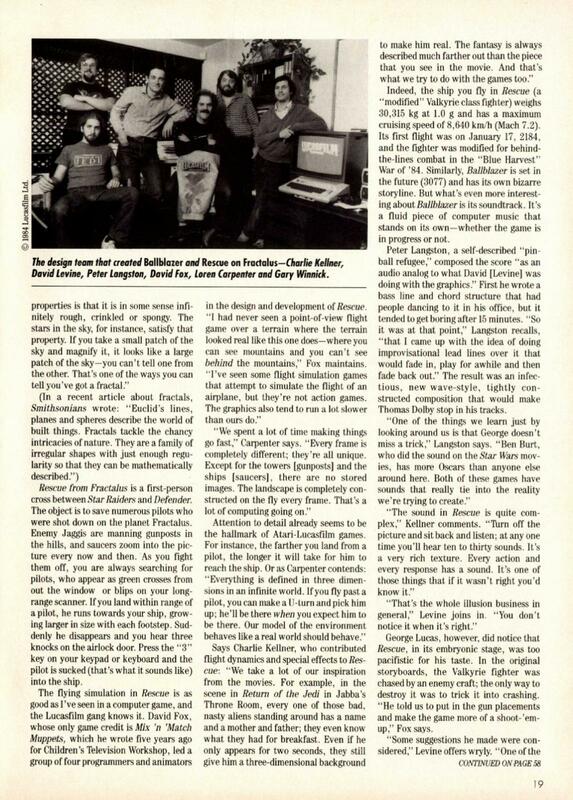 There was also a great interview with the programmers in a 1985 issue of Computer Games magazine. 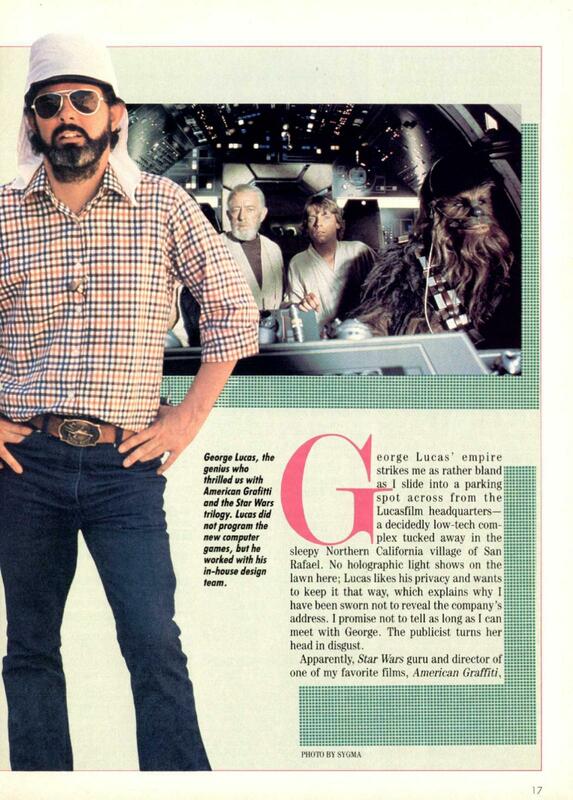 They discussed the genesis of this (and Ballblazer) and George Lucas's involvement. 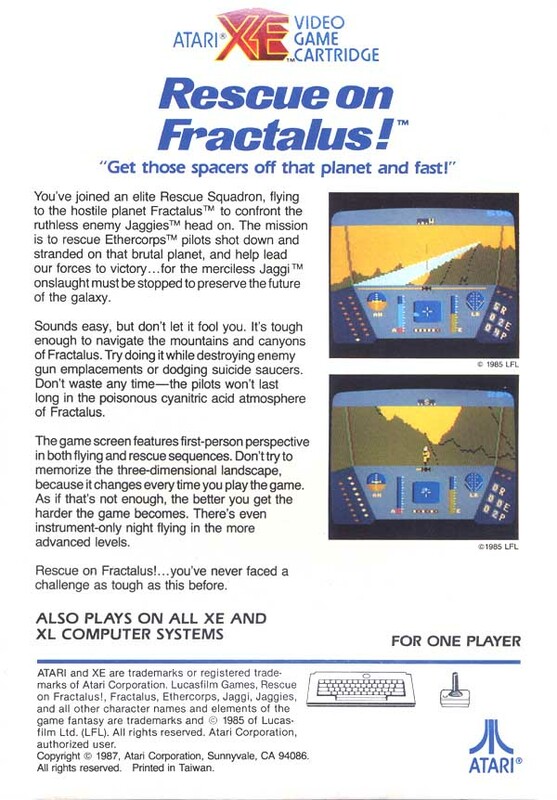 This was the first game to utilize fractal technology for home computer. Fantastic game. Realistic 3d environment great graphics and sound. 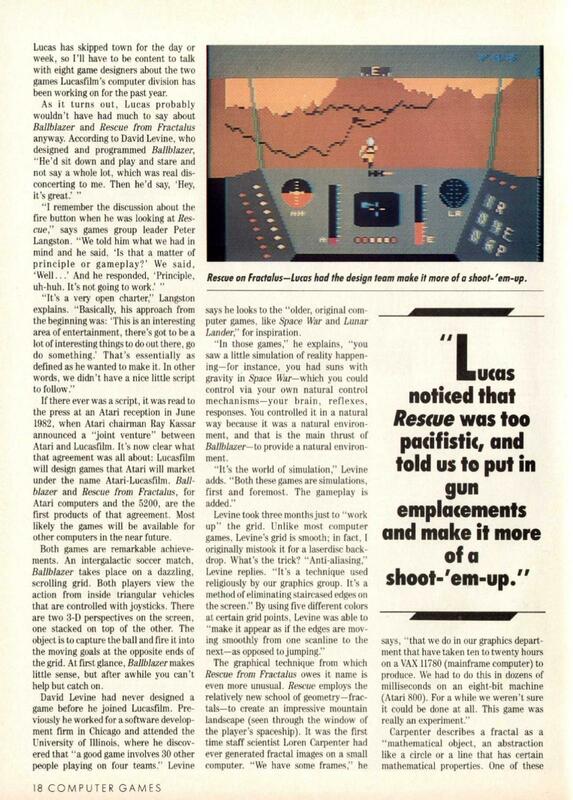 The atmosphere and 'tension' created in this game was a first, im sure, in home computer games. I will never forget playing this with my friends, with the heart stopping anticipation of deciding whether the humanoid is an alien or not. Fantastic! Spectrum and amstrad could never deliver this heightened experience, it really proved what the atari 800 could do in the right hands. Classic. This was one of my favourite games back in the 80's, and still is today. 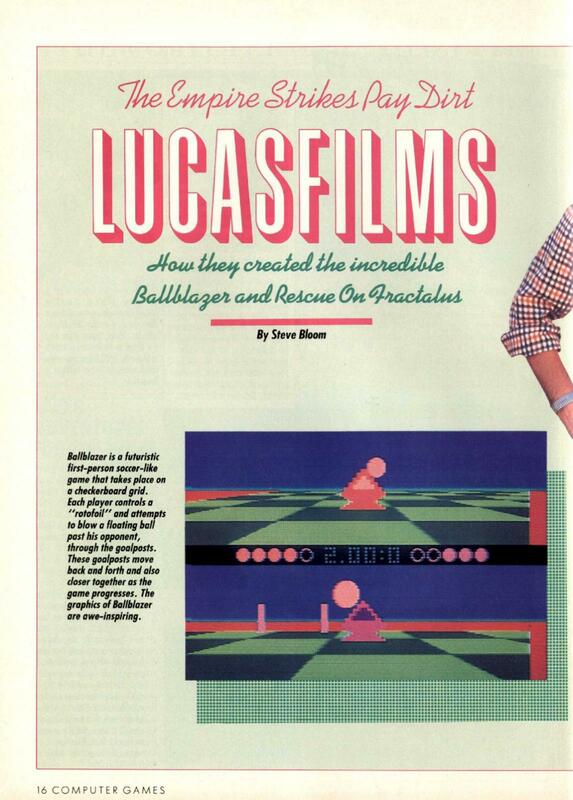 I believe this and Ballblazer were the first games from Lucasfilm Games. A fantastic debut. 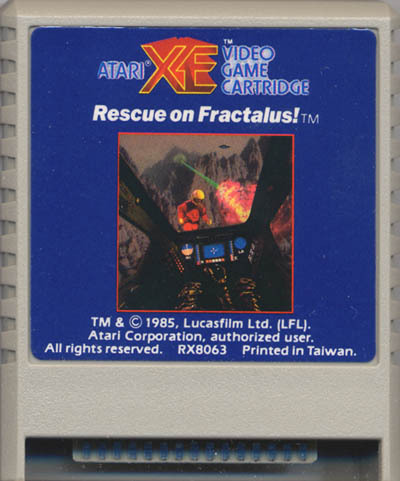 The 1987 cartridge version represented my first exposure to Rescue On Fractalus and I couldn't have been better surprised. From the groundbreaking fractal graphics, the real time approach (day and night are represented in this simulation), the fast decision making needed (do you fry this pilot ? Is he an Alien ?) 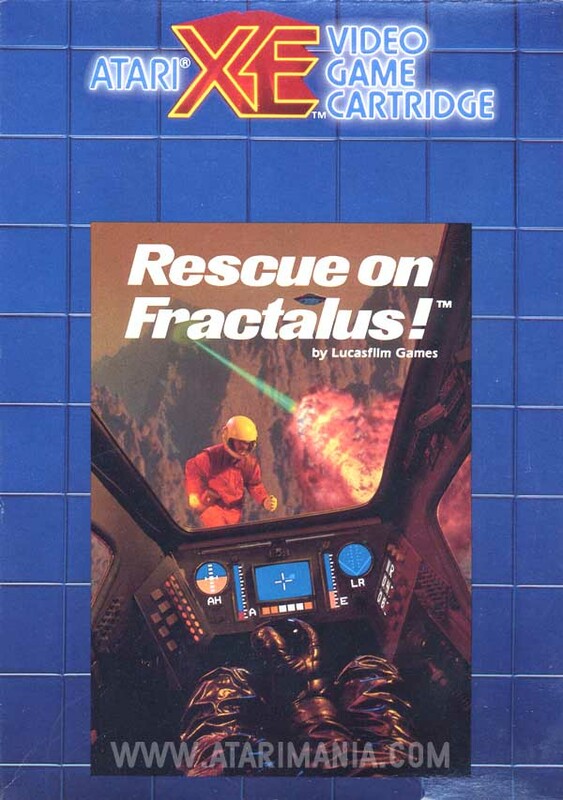 to many other aspects of the gameplay make of Rescue Of Fractalus one of the best games EVER on the Atari 8bit Platform. The best part of it ? 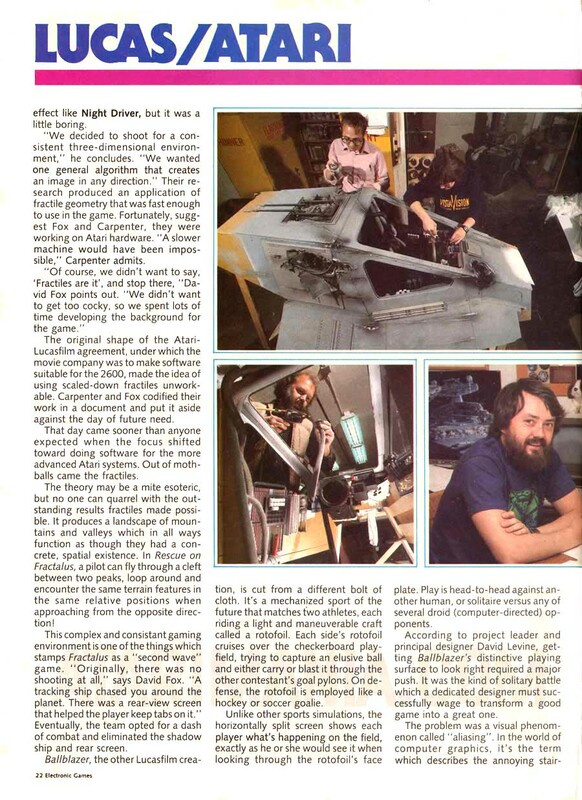 The ATARI version is the real "deal" and is way above all conversions as it was intended and developed by Lucasfilm Games for the Atari 8bit in mind. Couldn't be better ! Yeah, I was among Those, Who Almost Shat Their Pants at The Alien's Attack. Awesome. Is was that knocking on the door bit that always got me kakking it. What an amazing game. 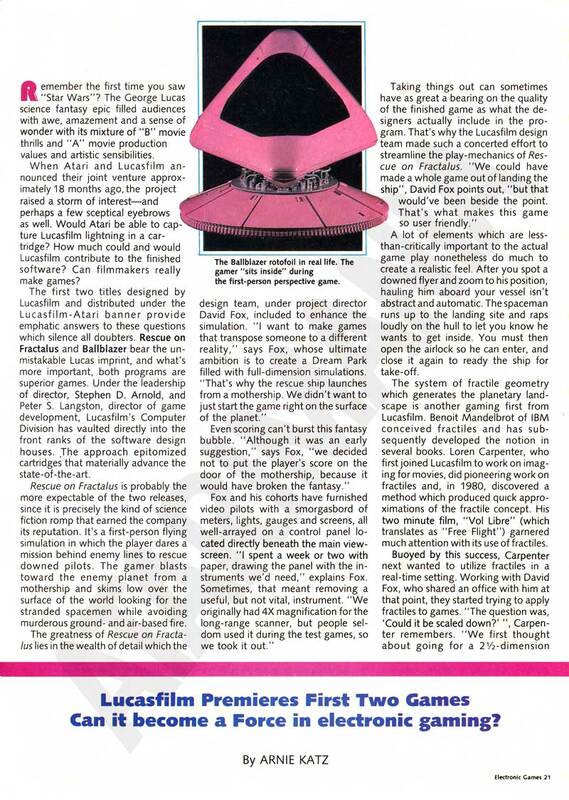 It really did show off what the Atari 8-bits could do. 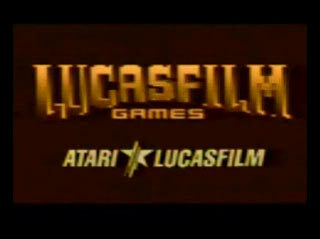 The intro graphics were amazing on all the lucasfilm games (do you remember the space station thing with the ships flying out of it). But the moment that the alien popped up. Jeez, forgot your silent hills and resident evil. 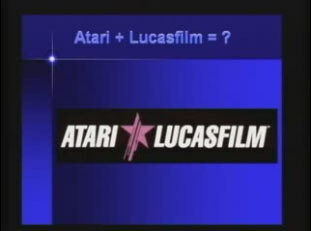 As a young boy staying up late to play the game, I just about had a heart attack. Even now when I play it as an adult, I still get anxious. Great. Back when I was the recipient of pirated games, I received a copy of "Rescumsn" which was sort of a demo version. It didn't have a space station sequence (started right in the launch bay) and there were no hero pilots, just white humans and white/green aliens. This was back in 1986. Kris is spot on with his 'fear factor' comment. 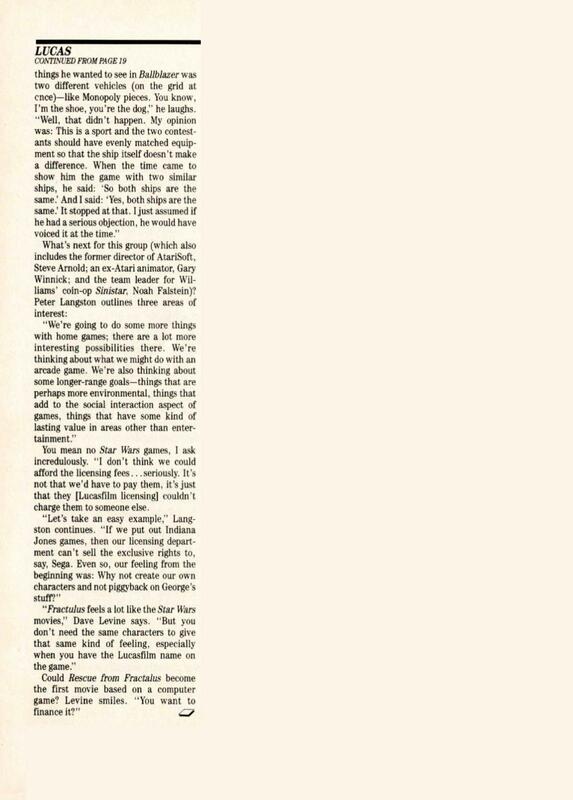 I remember playing this for this first time late one night on my own. I nearly had a heart attack when that hideous Jaggi jumped up at the window of my ship. Before I'd recovered from the shock he'd smashed the window and 'Game Over'. Even after many years of playing cutting edge PC games nothing has topped that moment for sheer terror in a computer game. Also the effects of flying through the mountains in Fractalus are the best ever on an 8-bit machine. Oh, and the superior Atari version knocks spots off the C64 version. Rates alongside Star Raiders and Dropzone in my opinion. Type "AUTHOR" on level select screen to reveal credits. A fantastic game with beautiful graphics. I will primarily remember the heart-stopping fear that I felt the first time I encountered an alien in front of my ship. Quite possibly the single scariest moment ever created in a computer game of that era. There are thirty levels you can choose from in this version instead of sixteen in the original release. Behind Jaggi Lines! was the working title of this game. Type 'AUTHOR' on the selection screen to see programming credits. It reads “BY D.FOX L.CARPENTER C.KELLNER P.LANGSTON”. Typing AUTHOR on the title screen reveals credits!